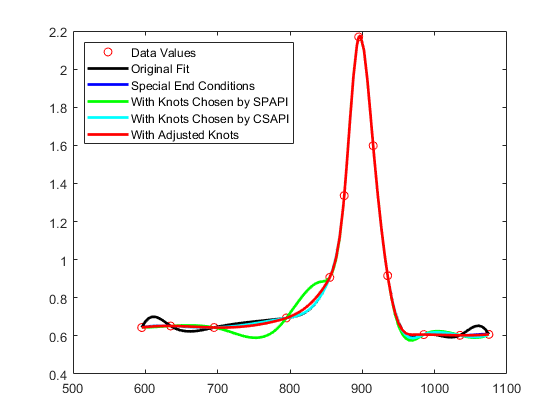 This example shows how to use commands from Curve Fitting Toolbox™ to fit a spline to titanium test data with manual and automatic selection of knots. 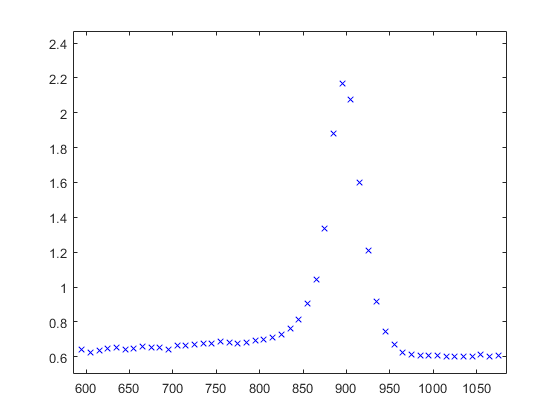 Here are some data that record a certain property of titanium, measured as a function of temperature. 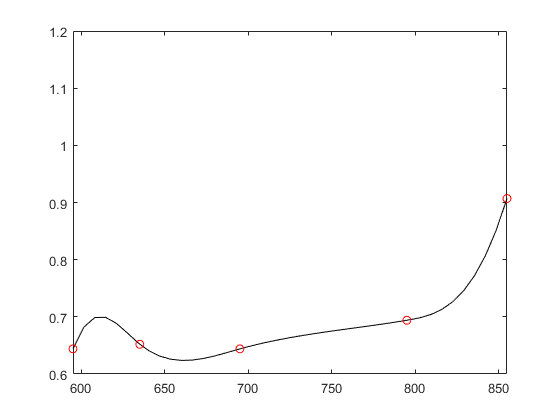 We'll use it to illustrate some issues with spline interpolation. 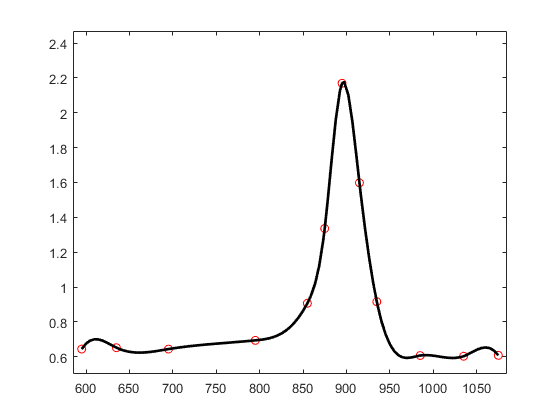 A plot of the data shows a rather sharp peak. We pick a few data points from these somewhat rough data, since we want to interpolate. Here is a picture of the data, with the selected data points marked. 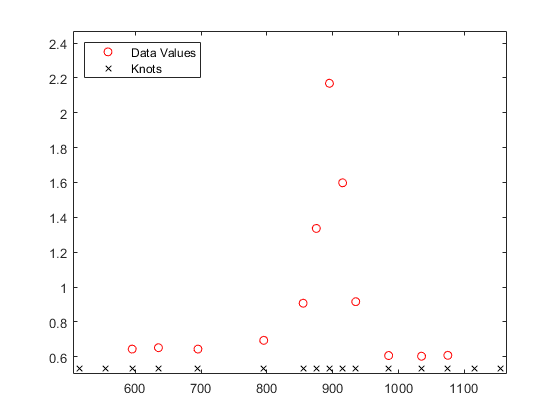 Since a spline of order k with n+k knots has n degrees of freedom, and we have 12 data points, a fit with a fourth order spline requires 12+4 = 16 knots. 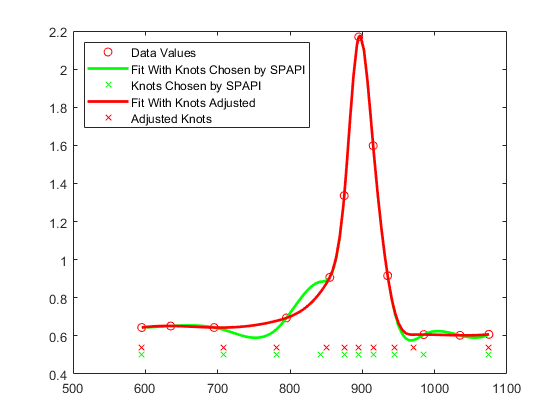 Moreover, this knot sequence t must be such that the i-th data site lies in the support of the i-th B-spline. We achieve this by using the data sites as knots, but add two simple knots at either end. We use this knot sequence to construct an interpolating cubic spline. Now, for the plot. 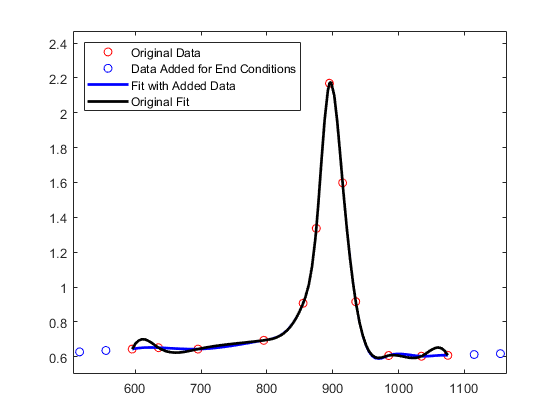 Since we do not care about the part of the spline outside the data interval, we restrict the plot to that interval. A closer look at the left part of the spline fit shows some undulations. 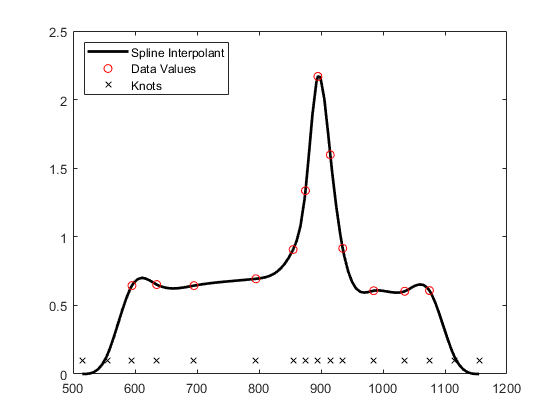 The unreasonable bump in the first interval stems from the fact that our spline goes smoothly to zero at its first knot. 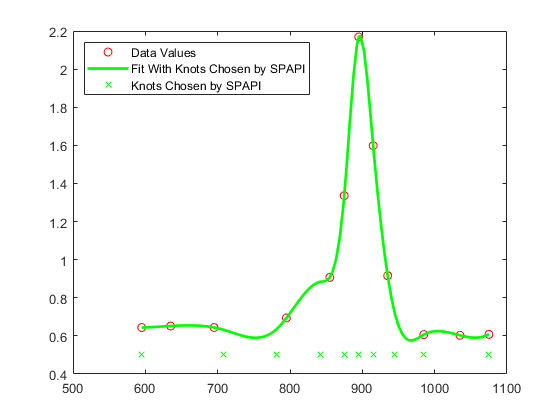 To see that, here is a picture of the entire spline, along with its knot sequence and the data points. Here is a simple way to enforce a more reasonable boundary behavior. 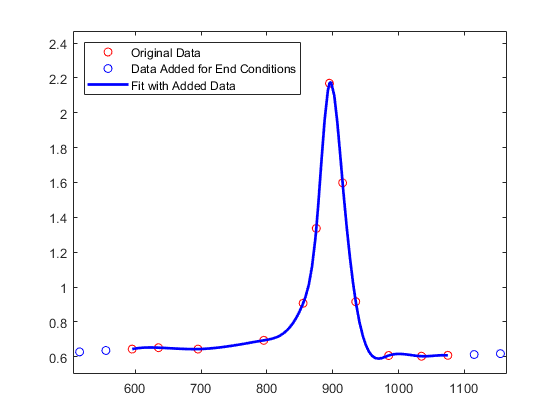 We add two more data points outside the given data interval and choose as our data there the values of the straight line through the first two data points. 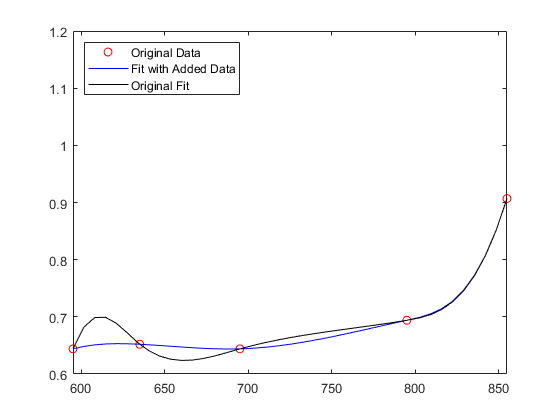 Here is a comparison of the two spline fits, to show the reduction of the undulation in the first and last interval. Finally, here is a closer look at the first four data intervals that shows more clearly the reduction of the undulation near the left end. 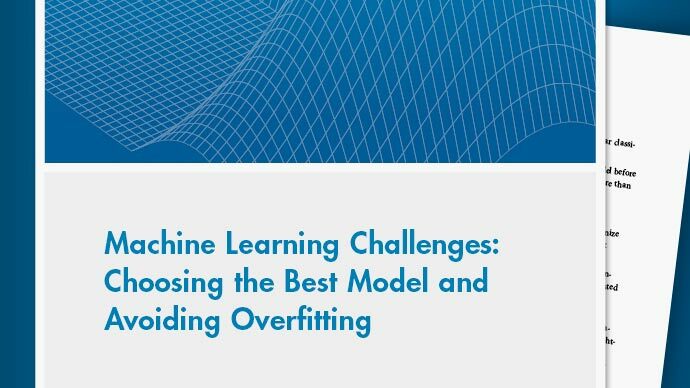 If all this detail turns you off, let Curve Fitting Toolbox choose the knots for you. Specify the desired order of the interpolant as the first input argument to the spline interpolation command spapi, rather than a knot sequence. Below is the result of a much better knot choice, obtained by shifting the knot at 842 slightly to the right and the knot at 985 slightly to the left. Or else, simply try the standard cubic spline interpolant, supplied by csapi. This amounts to a slightly different choice of knots. With such rapidly-varying data, it is hard to get agreement among all reasonable interpolants, even if each of them is a cubic spline. 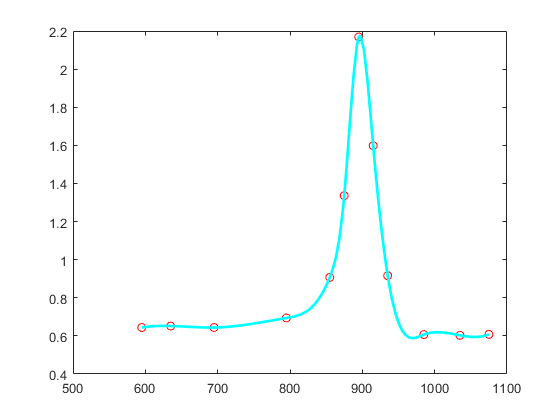 The plot below shows all five interpolants, for comparison.